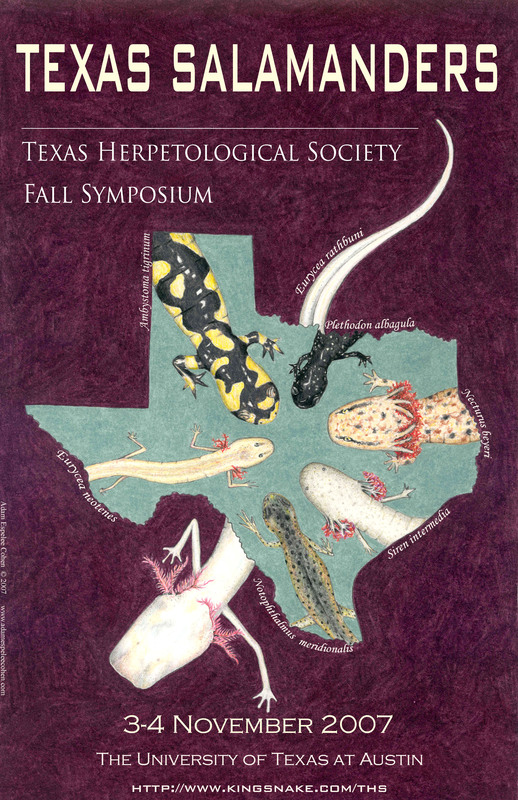 Several years ago I attended a Texas Herpetological Society meeting which focused on Texas salamanders. As many biologists are apt to do when encountered with art featuring their study species, I flipped out over the poster for the event, which depicted several species of salamander found in Texas (and of course, I bought several copies for all of my “salamander friends”). Last fall, when I started volunteering at the Texas Natural History Collections for the Fishes of Texas project, I was delighted to meet and work with the artist who created that poster – biologist Adam Cohen! One of the striking images when you enter the Texas Natural History Collections (besides the jars and jars of dead things) is a fish-print of the state-record tarpon – a 210 pound 11 ounce behemoth of a fish, immortalized on fabric and ink using the Japanese Gyotaku fish-rubbing technique. After helping fellow biologist Andy Gluesenkamp create the tarpon print, Adam Cohen and Ben Labay were inspired to begin a collaboration to create more prints, and to expand the subject matter well beyond fish! In fact, Andy recently told me how Adam simply came alive with excitement when he participated in printing the tarpon. (And, just FYI, you can view another edition of the record tarpon print at the Texas Freshwater Fisheries Center in Athens, TX). 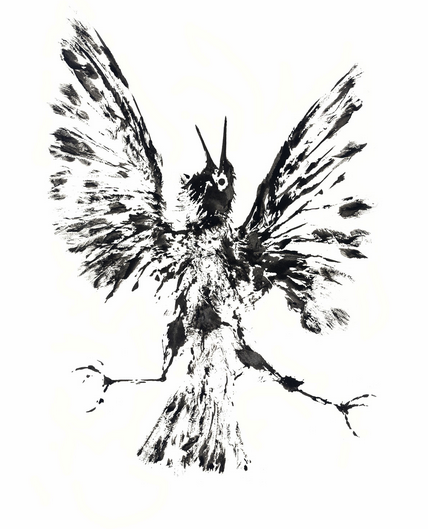 Well, I’m pleased to say that Adam and Ben have now officially joined forces by opening their online gallery and blog Inked Animal, featuring stunning prints of a diversity of animals (and soon-to-be plants) using ink, clay, paper and fabric. It’s now my dream to just happen to be volunteering one day when these two are making a print, so I can do one too [**hint, hint, guys**]! 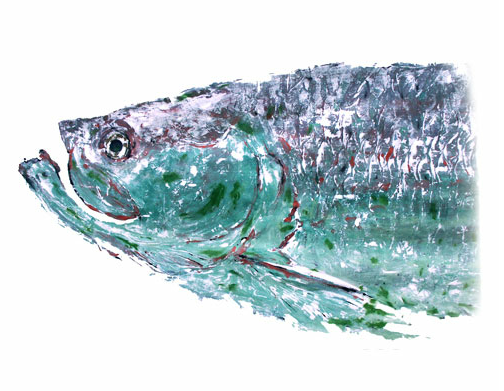 Tarpon head | Megalopidae. Gyotaku print © InkedAnimal.com, used here by permission. [biocreativity] Welcome to the biocreativity blog, Adam and Ben! What type of work do you do? [AEC] I make most of my living as a biologist working at the Texas Natural History Collection’s Ichthyology Collection on our Fishes of Texas project. The building I work in is basically a warehouse full of jars of dead fish mostly collected from Texas. It’s pretty creepy to lots of people, but I never had that feeling about it. We do lots of collecting for work, which means going into the field with collecting gear such as seines, gill nets, and shockers. But, I also think of myself as an artist. After high school I thought I might go to art school and pursue a career in art, but figured I was less likely to find a job in that field so stuck with science. My brother and I started a concert poster business in 2001 called Silverfish Art – I was the artist and he did marketing and sales. I am now working with Ben Labay on a new project called Inked Animal. In this project we are essentially taking the classic Japanese fish print Gyotaku concept and expanding to all kinds of animals, like birds, mammals, reptiles etc. There is essentially no animal or plant off limits. Being field biologists means we get lots of opportunities to encounter dead animals often as road kill or just random encounters. [BJL] I am a fish biologist and researcher as a profession, art and nature enthusiast as a hobby. My profession and hobby come together with Inked Animal. It’s a place for me to explore the reasons and inspirations for why I chose to study biology. Alligator Gar | Atractosteus spatula. Gyotaku print © InkedAnimal.com, used here by permission. [biocreativity] Where do you see yourselves on the biocreativity spectrum? Closer to the arts end or the science end? [BJL] Science end of the spectrum, I think. My primary training was in science, I got a BS in biology from the University of Texas at Austin, and a Masters from Texas State University – San Marcos. [AEC] My primary training is definitely science and I have no real training in arts except for taking some classes when I was a kid. I went to undergraduate school at the University of Texas at Austin and continued to get my Masters there as well. Both are biology degrees. Regarding the spectrum, I shift around depending on my mood or recent events in my life. I’m pretty much never at one end or the other though. North American Beaver | Castor canadensis. Gyotaku print © InkedAnimal.com, used here by permission. [AEC] I think a lot of people separate them and would come to this blog thinking this were an unusual line of questioning. But, I’ve been thinking about this for a long time. Personally I think a lot of my interest in biology was kindled by an artistic side. I remember keeping aquaria when I was younger and watching the fish for hours. There was an appreciation for the way they looked that drove me to learn about how to keep them alive and healthy. Now in the museum I often see a shelf of specimens and am struck by how they line up to create great repeating patterns. I have a one and half year old daughter at home and I’ve been watching for signs of artistry in her, but have not been able to see it yet. But, when she explores the back yard it seems to me that she is purely curious like a scientist so maybe that develops first. [BJL] I don’t think they always intersect. For that reason I don’t know if they need to be taught together, but for the same reason, when they do come together it is that much more special. Not sure that they inform each other, rather they complement each other, like how left- and right-sided brain activities can complement each other. Western Diamondback | Crotalus atrox. Gyotaku print © InkedAnimal.com, used here by permission. [biocreativity] Tell us a little more about your art-science projects. [AEC] Most of my own art is done with colored pencil and paper, but I’ve also worked with acrylic paint. I went through an experimental insect art phase where I arranged real insects into various compositions. 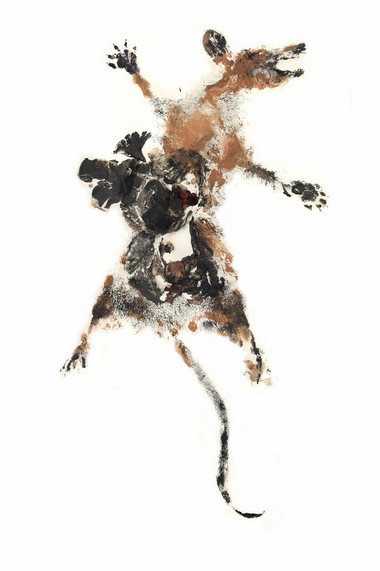 But most recently, I’ve been working with Ben Labay on our Inked Animal project. You can see my illustrations at www.AdamEspeleeCohen.com and my concert posters at www.SilverfishArt.com. 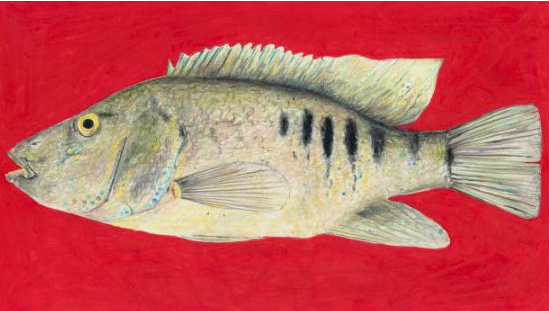 Minckley’s Cichlid | Hericthys minckleyi. Pencil illustration © 2004 Adam Espelee Cohen, used here by permission. [BJL] I have been focusing on impressions of nature, right now limited to inking animal specimens and creating a pressing/impression of it on paper or cloth. For fish, this is commonly known as the Japanese art of Gyotaku or “Fish rubbing”. Minckley’s Cichlid | Herichthys minckleyi. Gyotaku print © InkedAnimal.com, used here by permission. 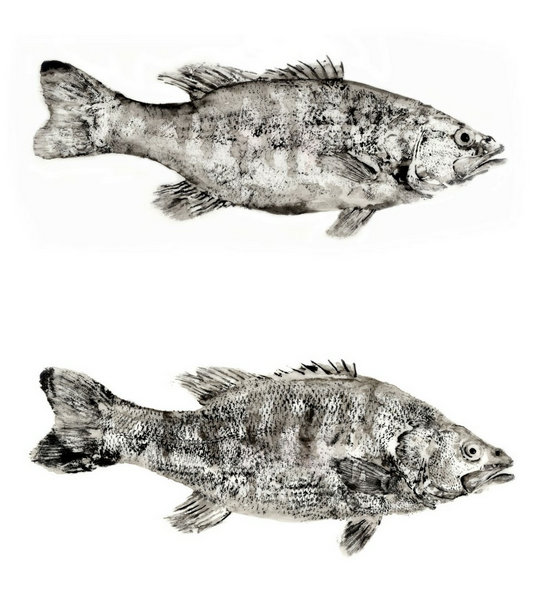 [biocreativity] Just to give a little context here, Gyotaku originated so that fishermen could record the size and quantity of fish they caught before taking them to market. It has now become a beautiful and culturally important art form. What inspired you two to get into this technique and begin your Inked Animal project? [AEC] My art has always had a biological component. Not sure why exactly, other than that I have no interest in working with other subject material. I’d done the ink prints in the past when I was younger (with octopus and flying fish), but got back into it again after a co-worker [biologist Andy Gluesenkamp] asked if I was interested in helping him print some large fish he had recently acquired. I did some printing with him and sort of got the bug again. Shortly after that I did a concert poster which was an ink print of a nestling white winged dove that I found dead in my front yard and got hooked into doing this with all kinds of other animals. My partner in this project, Ben Labay, who I also work with at the museum soon called me saying that he had found a grey fox on the side of the road and pretty soon we were off and running. It helps to have a good partner since you can get so much more done and you get to feed off each other’s energy. [BJL] I saw the fish rubbing done with a large tarpon by Adam Cohen and Andy Gluesenkamp. This started Adam and I on a path to do more and more. Gray Fox | Urocyon cineraergenteus. Gyotaku print © InkedAnimal.com, used here by permission. 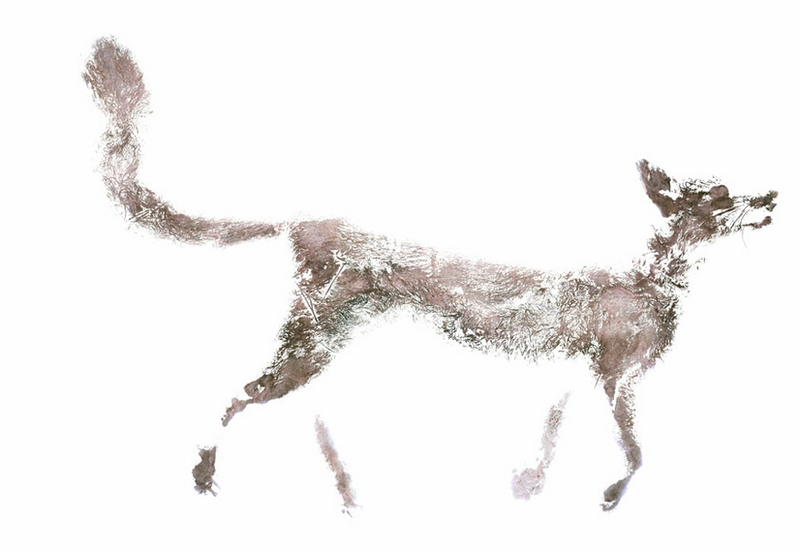 [biocreativity] The fox print is so beautiful; very ethereal, much like living foxes seem to be. What is the most important thing that you want others to know about your Inked Animal work? 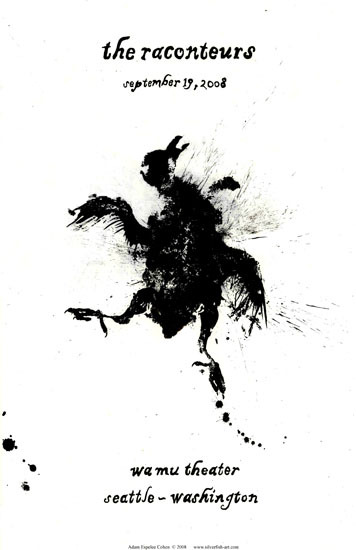 [BJL] That we create the work out of respect for what creates the impression, trying to capture a special and unique version of it that simultaneously acknowledges the corporeal and spirit of the animal. [AEC] I always worry about people thinking we are going out there into nature killing animals rather callously and selfishly for our personal project. I don’t think that’s accurate. In fact doing this project has forced us to confront how we feel about committing animals to death. It turns out that neither of us has much trouble killing fish, we do that for a living after all at the museum. But neither of us has much of a stomach for killing much else, so almost all of the other material are found dead on the road. Whenever it is possible we donate specimens to the museum after we have printed them. European Starling – Windshield Pose | Sturnus vulgaris. Gyotaku print © InkedAnimal.com, used here by permission. [biocreativity] What is the most common question or comment you get about your work? [AEC] Specifically regarding the Inked Animal project, people often ask us about our methods. We are still experimenting with the methods and I’m not sure that will ever stop. Basically animals are painted with ink or clay (I am starting to prefer clay) and then pressed against paper or other material. Sometimes we handle the specimens (leaving the paper in place) and other times we handle the paper (leaving the specimen in place). Then manual touch up with a brush or pen is often needed. But I think people are really most interested in knowing how we deal with dead and often rotting animals. We sometimes wear latex gloves, but gloves make it hard to feel what you are doing so usually we don’t wear them. It is an art done best if you have a strong stomach and a bad sense of smell. Some of my favorite prints of ours are the ones with blood stains where components of the animal are included as part of the print. Virginia Opossum – version 1 | Didelphus virginiana. Gyotaku print © InkedAnimal.com, used here by permission. [BJL] Yes, it’s probably about the process. People wonder how we do it. 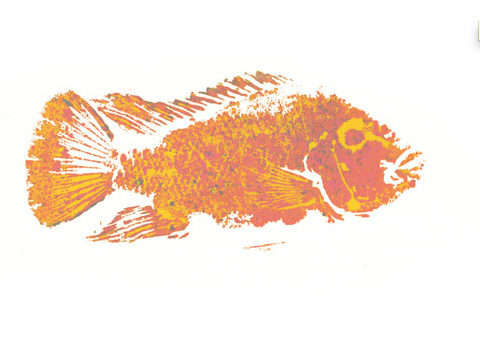 [biocreativity] I read on the InkedAnimal blog that sometimes in the process of printing an animal (especially fish, since that’s primarily what you study), you might notice new and different characteristics that you can use to help identify different species. Can you tell us more about this and how it can feed back into your science? [AEC] Through working with specimens as objects of art we’ve noticed bits of specimen anatomy that we’ve overlooked before or otherwise never took the time to take a close look at. Some come to mind immediately: sensory pores on alligator chins, dense hair in opossum pouches and their fingerprints, bifurcating genitalia of snakes, unusual mutated scales on fish. The most striking kinds of things we notice are related to various pores and crevices which become very obvious once ink fills them in. I’ve started keeping my camera close by when printing to catch some of these things and those pictures are included on some of our blog posts. We inked a menhaden recently (http://inkedanimal.com/gulf-menhaden) and as the ink settled into the pores we noticed the incredible network of sensory canals of the head that allows the fish to sense near-by fish and form dense schools. Also recently while printing a Guadalupe bass we noticed the relatively small cheek scales that the ink made much more evident. This is a character used to differentiate this species from the largemouth bass. Interestingly enough, we first learned about that character from Joseph Tomelleri, a well-known fish illustrator. I’m guessing he knew about that character due to the careful observation needed for his art. That’s a character I haven’t seen in any fish ID books. Fish biologists often use inks and dyes as tools for intentionally doing these kinds of things, so I don’t think we are doing anything cutting edge or making new discoveries for science (although we could), but it certainly helps in my education and makes me a better observer and scientist. Guadalupe Bass | Micropterus treculii. Gyotaku print © InkedAnimal.com, used here by permission. [BJL] I think Adam really summed that one up. For me, I’m not sure that there’s much of a direct impact of the art onto the science, but the main point I like that Adam makes is about using the printing process to help be a better observer, which is what science is all about. So looking at it that way, it’s not any details, but the process that helps us make better identifications, maybe remember certain characters, and generally have more respect for the animals we deal with and nature in general. [biocreativity] What’s next for you guys in art + science? [AEC] As with most of my projects I don’t know exactly where the Inked Animal stuff will go. We basically do it because we like to. We are currently focused on building up our online gallery and have a lot more material to get up soon. Once we build up the gallery we’ll work on trying to make a little money from our work. [BJL] Oh, and we have an immediate goal of creating a “Spineless” gallery that will at first feature insects, but hopefully get some mollusks in there as well. The next big step is to get a show at a gallery. Jack Crevalle 2 | Caranx hippos. Gyotaku print © InkedAnimal.com, used here by permission. [biocreativity] An invertebrate gallery sounds very cool! Where can the biocreativity readers learn more about your project and see more images? [AEC] Our Inked Animal project (www.InkedAnimal.com) also has a Facebook page at www.facebook.com/InkedAnimal. Blacktip Shark 3 | Charcharhinus limbatus. Gyotaku print © InkedAnimal.com, used here by permission. [biocreativity] Any advice to young artists and scientists who might be thinking about getting into art-science projects? [BJL] Don’t think, just do. Ready, Fire, Aim. [AEC] No specific advice. Honestly, I feel like I don’t really know what I am doing. Atlantic Stingray | Dasyatis sabina. Gyotaku print © InkedAnimal.com, used here by permission. [biocreativity] Well, Adam, it sure seems to me that you do! And, I suppose I will interpret Ben as not being afraid to experiment (I agree). Thanks so much to you both for sharing your work with us on the biocreativity blog! I’m sure the readers look forward to seeing what comes next. I know I do! The biocreativity blog’s ECO Art + Science Series illustrates the many ways in which artists and scientists are combining their talents in the modern world. Stay tuned for more interviews right here at www.biocreativity.wordpress.com! If you or someone you know should be featured in this series, please send an email to biocreativity@yahoo.com. This entry was posted in animals, biology, museums, printmaking, uncategorized, wildlife and tagged fish printing, fish rubbing, Gyotaku, Inked Animal, Texas Natural History Collections by h. gillespie. Bookmark the permalink. 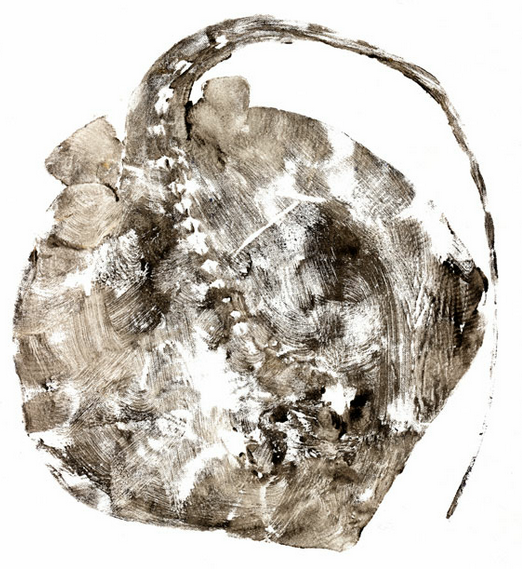 Pingback: Inked Animal | Impressions of Nature by Adam Cohen + Ben Labay | Art.Science.Gallery.